Most people will not think of winter when planning their pre-wedding photoshoot since it’s hard to imagine wearing a sleeveless gown in the negative temperature. It’s tough to be smiling widely when your facial muscles are frozen in place and your hands are painful from the cold wind. However, there simply isn’t another season to have your pre-wedding photos taken while still maintaining the magical fantasy-like backdrop that winter offers. Furthermore, you can bring some blankets and fur coats to warm yourselves up, these look extremely good in photos as well! A city full of majestic castles and cathedrals, there is no better place for a magical pre-wedding session than Prague. These stunning castles look even better when decorated with a bed of snow, adding a stark contrast to its stone walls. You will be walking into a real-life fairytale in Prague! The streets of Korea are beautiful when snow falls on this bustling city. However, the true treasure lies in the nearby Jeju and Nami Islands, when the expansive area is covered in purity. Some of our couples had a shoot during winter and the photos are nothing but mesmerising. Winter in New Zealand is slightly different compared to the rest since it rarely snows on ground level. When the leaves have fallen and the ground is bare, it exudes another kind of beauty that other winter countries can’t offer! For a bit of colours, you can have a photoshoot near the glaciers for a hint of icy blue that fits perfectly into the picture! Besides, you can get the best of both worlds by booking our helicopter shoots that takes you up to the snow mountains for an awe-inspiring snowy backdrop! It will be a total pity to not come back with stunning photos if you have bared it all for the cold. 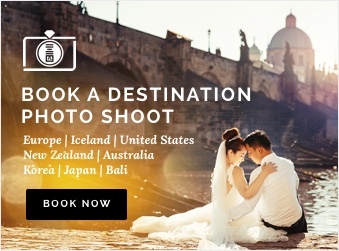 Don’t worry, OneThreeOneFour will make your trip worth the while and we will help you capture these magical moments for your once in a lifetime pre-wedding photoshoot. Head to our website for more details on our packages now!